Corkscrew Appraisals - Famous Corkscrew! Famous Painting! "The Rent Day". Home » Blog » Famous Corkscrew! Famous Painting! "The Rent Day". Famous Corkscrew! Famous Painting! "The Rent Day". "Corkscrews for Collectors" by Bernard M Watney & Homer D Babbidge was the first important book on corkscrews to be published, it was packed with new information. Today decades after the books first release it is still an exciting read, any collector without a copy should rush out and buy one. Those keen collectors who know the book well will be aware of its contents which include, on page 55 a detail from The Rent Day, a painting by Sir David Wilkie. (1785-1841), painted in 1807. Of interest to corkscrew collectors is a Thomason 1802 Patent Corkscrew seen on a small round table to the right of the painting, this is one of the earliest paintings known to show a corkscrew. It is difficult to see the IV pillar Thomason in the above image, it's on the white cloth on the round table seen to the front right. David Wilkie's painting clearly demonstrates the early wide spread success of Thomason's 1802 patent. I recently visited a flea market in Somerset and yes, it was my lucky day!! Rarely are good corkscrews found in the UK at such markets or antique fairs. 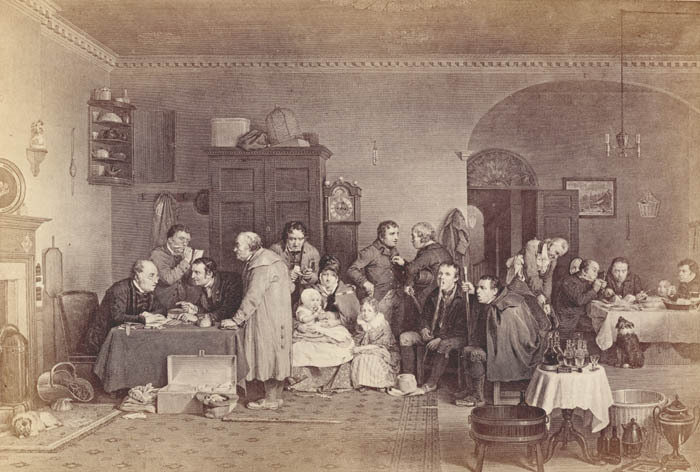 My visit to this flea market was no exception, however, I was fortunate to buy an original etching of The Rent Day. This etching was published January 6th 1877. A double whammy, on the floor adjacent to The Rent day was a second etching again by Wilkie, The Blind Fiddler. I purchased the framed etchings with a huge smile on my face. Below I have shown an example of The Blind Fiddler. The Blind Fiddler and The Rent Day images, show the complete paintings. If the reader looks carefully he can see many things of interest, both scenes are very busy. 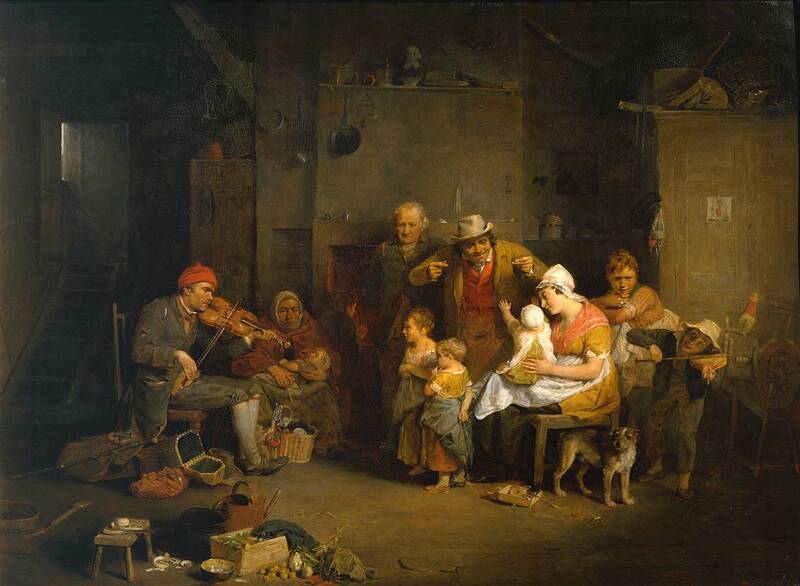 The Blind Fiddler painted by David Wilkie in 1807 shows a fiddler playing for a humble country family. Notice the small child mimicking the fiddler to the right of the painting. This painting was exhibitied at The Royal Academy and is equally as famous as The Rent Day. It is not often you get lucky twice at the same fair or market, most probably I have used up my luck for the rest of the year!! Shown above is the etching rather than the painting, here the IV Pillar Thomason can clearly be seen on the table. Wilkie, born in Scotland was the son of the Parish Minister of Cults in Fife. He developed a love for art at an early age. In 1799 his father reluctantly agreed to his son becoming a painter. He was admitted to the Trustees Academy in Edingburgh, where he began the study of art under John Graham. Wilkie had a habit of visiting fairs and market places. 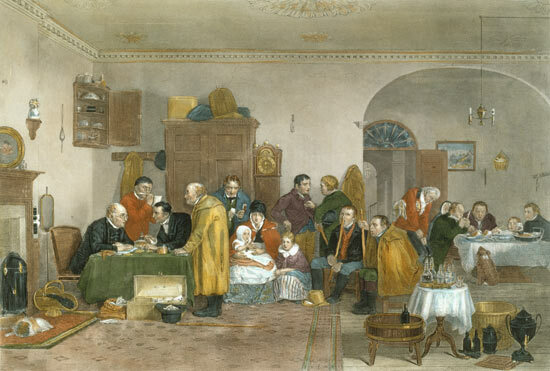 The Rent Day is considered one of Wilkies greatest works, it was composed during Wilkies recovery from a fever, contracted in 1807 while on a visit to his native village. Wilkies success in art was rewarded by professional honours. In 1809 he was elected an associate of The Royal Academy, in 1811 he became a full Academician. In 1812 he opened an exhibition of his collective works in Pall Mall. 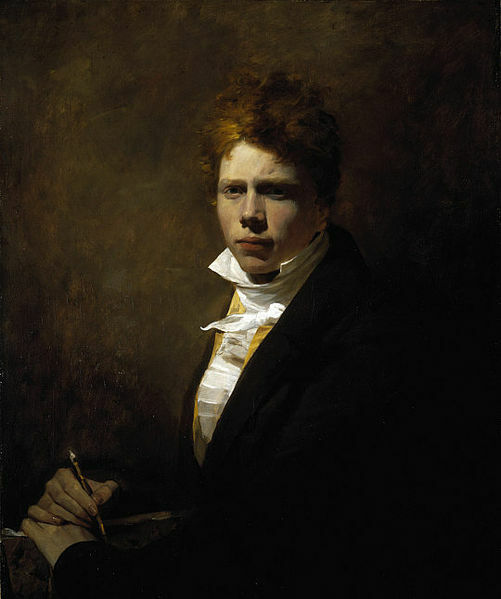 Above is a self-portrait of David Wilkie at the age of 23. I have an etching from 1877 as well that I have in my office and was given to me by my grandfather who purchased the etching while visiting London many years ago. Would something such as this have value to a collector?